Home / Entertainment / How Bollywood celebs spend their spare time? How Bollywood celebs spend their spare time? Once again, the Dabangg actress Sonakshi Sinha has stirred the internet, this time with her favorite pass time – dancing. 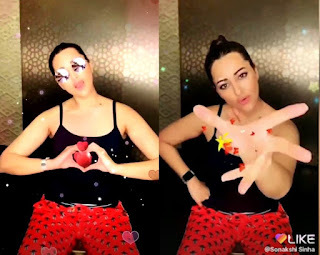 Sonakshi shows off her groovy moves with gorgeous special effects on her fun and quirky video on LIKE app. Her eye-catching expressions are winning our hearts over and over again. Besides her acting, her social media handle showcases her love for travel and her stunning wardrobe looks. Social media has truly become a platform for one to express their individuality and Sonakshi has used this to the fullest by creating this video for her 12.6 million followers showcasing a lit bit of her life or as her fans love to call it the Asli Sona life. LIKE App is a leading social video platform created by BIGO Technology PTE. LTD., a developer of video editing, video broadcast and VoIP-related products used around the world.